Our comprehensive range of eyecare services is designed to answer all of your eyecare needs. With our dedicated eyecare team, we are sure we can help every patient receive the quality service in eyecare they deserve. By providing peace of mind to each and every patient, we will surely make you feel at home. Our optometrist office is conveniently located in Cerritos, CA. We also serve Artesia, La Palma, Norwalk, Cypress, Downey and the surrounding areas of southern California. At our office, we treat a wide range of eye conditions including Dry Eyes, Foreign Bodies (metal, wood, etc removal), Eye Allergies, Pink Eye (Conjunctivitis) and Diabetic Retinopathy. See below for more information about our eyecare services in Cerritos, CA. Learn about what’s involved in a comprehensive exam. Also, discover how our modern, high-tech facility is designed to make your comprehensive eye exam the most thorough and accurate exam you have ever had, while being most efficient with your time. Learn about our contact lens exam services for all ages and visual needs. Our office routinely fits patients with conditions such as astigmatism, dry eyes, bifocal, and multifocal needs. We also serve patients looking to safely enhance or change their eye color with healthy lens options. Learn about common urgent eye conditions that we are available to treat. Learn when kids should have their first eye exam and what a children’s eye exam includes. Learn about our refractive surgery services and the phases of the laser vision correction process. 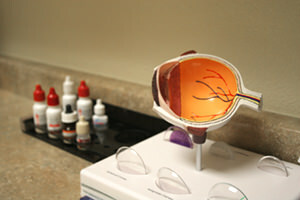 AllAboutVision.com provides a vast amount of quality information about eyecare and vision correction.